INFJs are certainly one of the most mistyped personalities out there, but often it is people believing they are INFJ when they are not. The fact that they are so rare and so few of them are roaming around the world, would signify that you won’t run into them constantly. Yet they seem to be prevalent online, which can mean this is where they flock to, and it can also mean they are mistyped a decent amount. Regardless, any personality type can become mistyped often, simply because uncovering the details yourself is challenging. Unless you are hiring a professional it can be difficult to type accurately, and even then it is no perfect science. It requires digging deeper and really understanding the personality types and their variations. INFJs are most frequently mistyped as INFPs, ISFJs, or ENFJs, but even on occasion INTJs. There are many reasons why this occurs, most of all it comes from a lack of time invested into really uncovering the complexities of each type. 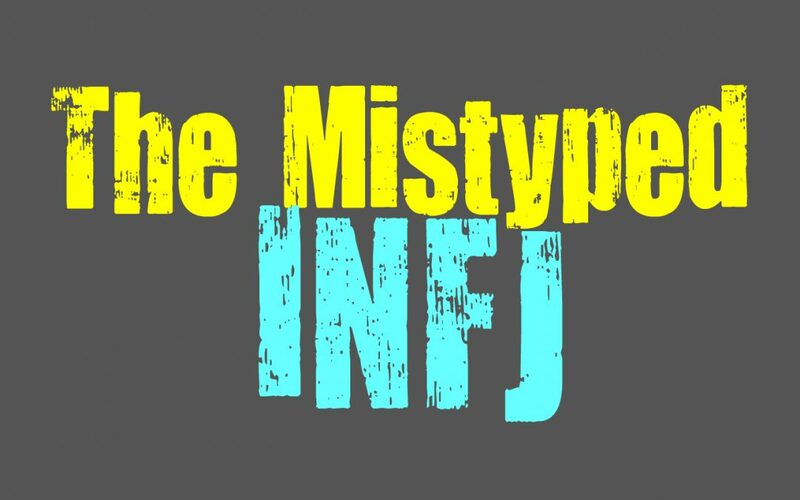 In order to avoid mistyping the INFJ, it is important to understand their similarities and differences between them and the types they frequently are mistyped as. The most basic of confusions comes from simply paying attention to the letters instead of the functions of each personality type. This is why INFPs and INFJs become mixed up, when it truth they are very different. They might share similar letters, but when you dig deeper you will see that they don’t share any common functions. This makes the way INFPs and INFJs process information and express themselves, extremely different. They both connect with their inner minds and enjoy plenty of time alone, and they also enjoy meaningful things. Both INFJs and INFPs dislike anything shallow and believe deeply in searching for a sincere meaning in their actions. They are complex people with deep souls and minds, and these things often make them appear similar. While they do have similarities, the differences are immense between these two types. INFPs are dominated by their introverted feeling function, which relies on their inner emotions. They focus on these inner feelings and morals, and this is what guides their actions most of the time. INFPs process everything through their emotions, and so they strive to follow these firm beliefs and ideals. INFJs on the other hand are more connected to their intuition as a means of making decisions and following a path. They have a sense of what actions to take based on their intuitive abilities, but on top of that INFJs are more focused on the emotions of others than their own. Both types process their emotions rather differently, one (the INFP) focused on their own inner feelings, and the other (INFJ) much more drawn to the well-being of those around them. The dominant function is often a major reason why types become mixed up. Our dominant functions are often the ones most visible to others, since they present themselves in more obvious ways. For the INFJ that is their introverted intuition (Ni), which is how they process the world around them. They subconsciously pick up information from around them and predict the most likely future outcomes. This is something that gives the INFJ a powerful sense of the future, and helps them to navigate towards the direction they most desire. This is something the INFJ shares with the INTJ, and is a reason why they can sometimes be mistyped interchangeably. While INTJs and INFJs are very different, there are also many ways they can appear truly similar without digging deeper. They both share a strong connection to their intuitive abilities, and use this to direct themselves towards a future they see most efficient and comfortable. INFJs can also appear much less emotional than other feeling types, since they keep to themselves most of the time. They can be stoic people, not easily showing their feelings to those around them. In truth INFJs do focus on emotions quite a bit, and are deeply feeling and compassionate people. They have a strong sense of caring towards others, and many of their goals are directed towards taking care of their loved ones. While this is a big part of who they are, it requires understanding them a little better to fully recognize this. On the surface they can seem stoic and as if they lack emotions, which can cause them to seem more like a thinking type. This is a major reason why INFJs are so easily mistyped as INTJs, since they can share some similar traits for those who don’t know them better. INFJs can sometimes be mistyped as ISFJs as well, since they are so connected to the emotions of others. Both ISFJs and INFJs are more reserved and internal people to the outside world. They can also spend a lot of their time and energy caring for others, and this makes them appear rather similar. Their shared compassion for their loved ones and the world around them, can cause the ISFJ and INFJ to seem quite similar. In their truth dominant functions are extremely different, and this is where they can be distinguished from one another. ISFJs are dominated by their introverted sensing, which is connected to the past and all things that are comfortable. They are sensing personalities, who look at things from a more practical sense than the sometimes dreamy and complex INFJ. They often see the world in very different ways and will approach things from opposite ends. While both types share a deep caring for others, they do not share the way they process information and often express it to others. ISFJs are likely to take a practical and focused approach, while INFJs are much more internal and focused on their intuitive sense of the future. The INFJ is idealistic and complex, while the ISFJ often enjoys things that are simpler and more wholesome. Often extroversion and introversion are the two major things that can be challenging to separate. The ENFJ and INFJ can very easily be confused for one another, since they are extremely similar. They share all of the same functions, they are simply organized slightly differently. It is important to focus more on their dominant function, rather than if they appear more introverted or extroverted. ENFJs can have introverted tendencies, since they enjoy being on their own and spend a lot of time inside of their own minds. While the INFJ can be extremely outgoing and friendly when they want to be. It is important to recognize what guides them most, since these things will differ just enough to recognize which is which. ENFJs are social creatures, but this is because they are mainly focused on tending to the needs of others. They will often neglect their desire to be on their own, so that they can provide for those around them. They process things through intuition, but are ruled much more by their desire to please others. The ENFJ might see that the most logical choice could actually be the one that harms others, and so they will not go with that decision in the end. They are guided by their compassion and their love for others, and this is what stands out the most with them. While INFJs care deeply for their loved ones, their main guidance comes from their intuition. Sometimes they will forgo comforting someone if they feel they need more direction and guidance. INFJs want to help others, but they want to do this by showing them the best path towards a better future. While INFJs can be confused and mistyped often, this can often be avoided by removing snap decisions. Understanding each type better helps to figure out how to differentiate them between other types. Knowing the INFJs personality isn’t the only requirement into understanding them, it is important to know the types they are often mistyped as, as well.